The Gala Coral Group, based in Nottingham, UK was founded in 1926 as a bookmaking business. Over the years they merged with various other casino companies and continued their upward growth. 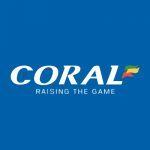 In October 2005, Coral Eurobet was acquired for £2.18 billion by Gala, a casino and bingo firm and their name was changed to Gala Coral Group. The partnering of the two iGaming companies flourished into the establishment of two online casinos, one of them being Coral online casino. In the UK they operate approximately 1800 betting shop and provide online sports betting and gaming products for mobile, tablets and desktop devices. Coral online casino has an exclusive offer for new players, if you deposit $/€10 they will offer you $/€30 bonus and 10 free spins with a 24x wagering requirement. The bonus can be used on any video slot machine in the Age of the Gods series. Any deposits made with NETeller, PayPal or Skrill are not valid for this exclusive offer. The second bonus is a 500% sign up bonus with a maximum bonus of $/€50 and a wagering requirement of 40x. This offer is valid for the slots, Blackjack, Sicbo, Craps and all their Roulette games. Coral casino offers a very tempting welcome Bonus scheme for new players. Tailor made for players with a very small budget, deposit $/€20 and they will match your deposit with 100% bonus match and 20 free spins. The welcome bonus has a 50x wagering requirements. The wagering requirement means that you will have to pay your bonus amount and winnings 50 times before being allowed to cash the amount. Coral online casino also has a special scheme called the ACCA Boost which allows you to boost your bonuses by fulfilling special criteria like playing an online casino game multiple times. There are also bespoke bonuses for sportsbook that come with free bets and special odds. They have no VIP scheme but instead work on a Loyalty based Priority Programme that works on a multi level system. Gaining Priority points can elevate you from Bronze level where your minimum deposit has to be €1000, Silver level with a deposit of $/€2000, and Gold level with a minimum deposit of $/€4000. The Platinum level is a “by invitation only” and can only be accessed by contacting the casino. Incentives are all reward based and tailor made for players’ gaming preferences. Priority points are earned in the following way: You receive 2 points for every $/€10 stake on Slots, Bingo and Scratch cards, 1 point for every $/€10 stake for all casino games, 2.5 points for every $/€10 wager and 3 points for every €10 stake for sports multiple bets. The Comp Point bonus programme is where Coral Casino awards one comp point to players for every $/€10 wagered and when players reach 100 points, they can redeem their points for $/€1 free play in the casino. Visit the Coral casino website often as they continually offer bonuses and promotions all year round. Coral online casino has a withdrawal time of 24 hours and also has weekend cashouts available. For the super security conscious they have even published a page detailing what exactly you will need to do with cookies and the meaning behind the security and how cookies interacts with your browser. This information is particularly useful for players wanting to track the precise movement of their online information. Coral casino has become a global name and as such provides online casino games from some of the best gaming providers in the industry, Playtech and Microgaming. Their range of games is also huge and they currently feature about 600 casino games, all very well displayed and easy to select. They have a catalogue of titles including hundreds of slots, Blackjack, Roulette, Poker, video poker, progressive jackpot games, arcade games and there are even scratch cards. Coral casino also has a very large live casino with some great games. Overall they have 20 variety of roulette games, 15 variations of video poker, 16 arcade games and 30 scratch card games. When it comes to their slot game offering, they have hundreds and in fact, slots make up the largest portion of the casino’s library. The games include dozens of titles based on TV and cinema. They also feature exclusive slots, daily jackpots, and UK casino classics. Original games like Rainbow Riches and Thai Flower Shots and some of the less common games like Red Dog and Stravaganza also make up their large slots library. With a very large variety of live casino games. You can choose from live Blackjack, Roulette, Baccarat, Hi-lo and Hold’em. Live casino games are hosted by real dealers which you can interact with and they will help you with your gaming every step of the way. Live casino gaming has taken the world by storm as it combines the very best features of a real land based casino with an online experience. Live casino is played from your mobile, tablet or desktop. Video link up to a real game and speak to real croupiers, observe them as they deal the cards, spin the wheels and acknowledge your bets. Coral casino’s live casino is a unique alternative to regular casino gaming with the only difference being that you can play from anywhere day or night. Learning a new game via live casino is so easy because if you have any questions, you can just ask and get an answer straight away. You can speak to the dealer with an in game chat system as if they were sitting across the table from you. The games are very immersive and you get to have complete control over your gaming experience. The mobile casino can be accessed instantly via Google’s Playstore or Apple’s App store. Coral casino is one of the very few online casinos that allows for special welcome bonuses for mobile players. There are about 250 games available for mobile play including table games and a variety Blackjack, Roulette and Baccarat. We’ve looked through the slot collection and our three picks for you are Halloween Fortune II, Age of Gods and Man of Steel. Customer service at Coral Casino operates 24 hours a day, 7 days a week. You can chat live or send an email. Alternatively Coral has a UK Freephone number which can be accessed from 8am until 10pm UK time. You can reach them from within the UK at 0800 44 00 11 or outside the UK at +44(0) 208 507 5544. There is also a call back service available that allows you to leave your telephone number and a customer service representative will call you back. Coral online casino is very popular in Ireland and the UK. They feature a huge variety of bonuses and promotions making it easier to play without spending your own money. Players in other countries might struggle a little as their online casino is only available in English and the bonuses are not available for anyone outside of UK and Ireland. In spite of its preference for UK and Irish players, they accept EURO and USD. The casino provides a very easy way to search through their casino games and a filtration system makes it easy to select your favourite games. Their customer dashboard is also very easy to use and provides all the information you will need to keep up to date, including accessing your balance remaining, promotions and messages. It is also very easy to make a new deposit, and when you realise your funds are running low, you can access a menu at the top of the page, click, enter and top up. Coral Casino have been around a long time and have built a good reputation for being an honest and friendly casino with excellent bonuses, great high quality games and an easy to use interface. There are hundreds of interesting and varied slot games and their live casino is very well equipped with classic favourites. A great secure online casino to spend hours and hours of fun and exciting gaming.